Advance estimates by Indian Central Statistical Office (CSO) indicate that India's GDP for year 2013-14 is $1.7 trillion, down 9% from $1.87 trillion reported for the previous financial year. However, Indian economy has grown from Rs. 100.2 trillion in 2012-13 to Rs. 105.4 trillion in 2013-14 in terms of local currency. CSO estimates India's economic growth rate in the current financial year at 4.9 per cent, a faster pace than in the previous year, mainly on an improved performance in the agriculture and allied sectors. 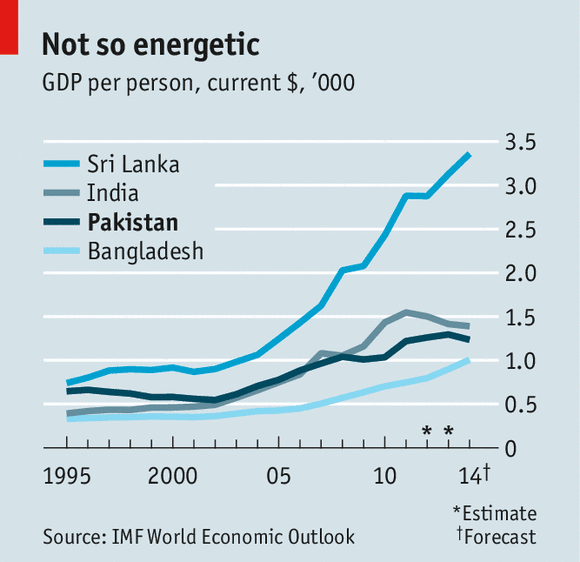 India's per capita income is estimated at Rs. 74,920 (US$ 1201) for the fiscal year ending on March 31, 2014, according to Indian media reports. It is up from Rs 68,757 in 2012-13 in Indian rupee terms, but down based on current USD exchange rates. While India's growth has slowed a lot in recent years, the recent decline of Indian economy in USD terms is the result of a sharp drop in the value of Indian currency against the US dollar. 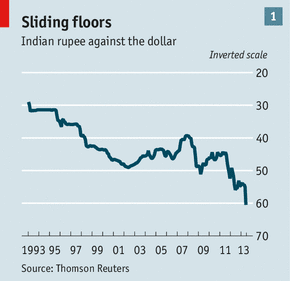 The Indian rupee has plummeted from 47.80 in 2012 to 54.30 in 2013 to 62.30 to a US dollar now. The free fall of Indian rupee has dashed the hopes of many in India, including former finance minister and current President Pranab Mukherjee, who were boasting about a $2 trillion economy as early as 2012. India is now among "The Fragile Five", a phrase first used by Morgan Stanley report last August amid an emerging-market rout caused by investors pulling out their money on speculation the Federal Reserve would soon reduce its bond purchases. That month, the Indonesian rupiah, South African rand and Brazilian real fell to the lowest levels in more than four years and the Turkish lira, like the Indian rupee, was at its weakest rate ever. The continuing weakness of the Indian rupee and the slow growth of Indian economy are likely to help the electoral fortunes of the Indian Opposition led by the Hindu Nationalist BJP leader Narendra Modi. India's Hyphenation: India-Pakistan or India-China? My guess is pakistan would have also contracted in usd terms. What if Modi becomes Indian premier? : Global private equity major KKR has ranked India second among the emerging markets on external risks, citing the high fiscal and current account deficits. "Our emerging market framework takes the view of avoiding twin-deficits countries at this point," the global fund said in its 2014 macro/asset allocation outlook. The country ended FY13 with an all-time high current account deficit of 4.8 per cent of GDP, which is slated to have improved significantly to 3.05 per cent in the first half of the current fiscal and may even be lower for full fiscal. What if Modi becomes prime minister? This cannot be further from the truth. Gujarat has always been a developed state from the time it was carved out of Bombay state in 1960. Economic indicators clearly show that Gujarat under Modi has been ‘worse off’ than under previous governments (even the BJP one before him). The fact is that foreign direct investment in Gujarat has taken a severe beating in the last few years and even local investment is far below what is being flaunted. Regarding social indicators, Gujarat fares poorly. A UNICEF report published in 2013 says social development in the state has not kept pace with economic development; almost every second child in Gujarat under five years old is undernourished, while three quarters are anemic. Many believe the courts exonerated Modi of involvement in the Gujarat anti-Muslim riots in 2002. The hard facts are, however, very different. First of all, no court has given Modi a clean chit. True, there is a Special Investigation Team (SIT) report that says there is not enough evidence against Modi. But this has been challenged, with the petitioner Zakhia Jafri being given leave by Ahmadabad magistrates to question the merits of the SIT report in a higher court. Raju Ramchandran, appointed by the Supreme Court as amicus curiae for many of the Gujarat riot cases, asserts that there is enough evidence to prosecute Modi on several counts with regard to the violence in 2002, in which more than 1,000 people died. Modi has neither shown any remorse nor taken responsibility for the killing of innocent people under his watch. The least a chief minister could have been expected to do was to enforce law and order and protect the life and property of every citizen in his state. That he ignored this responsibility, there is no doubt among many. That he has denigrated minorities has been documented by the print and the electronic media. There are some claiming to be representatives of minority Christian and Muslim communities who sing Modi’s praises. A careful analysis indicates these people have vested interests, especially in business, and are not really interested in their community or what is happening to minorities in the country. In 2003 Modi introduced an anti-conversion law and established rules to govern the implementation of this law in 2008. It is perhaps one of the most draconian laws in the history of democratic India. It forbids a citizen from converting to another faith unless she/he has permission from civil authorities. Even now, police and intelligence officers constantly visit Christian institutions and Christians in general, making all kinds of inquiries and demanding to check baptism registers and other records. In May 2012, anti-corruption campaigners Anna Hazare and Arvind Kejriwal visited Gujarat. They came away declaring it the most corrupt state in the country. Why they have not continued to highlight corruption in Gujarat is anyone’s guess. Several years ago, the Tata Motor Company was allowed to establish a plant to build the “world’s cheapest car” in Gujarat with surprising ease, flouting every rule in the book and even the state’s industrial policy. Myth 4: Modi had a personal hand in 2002 riots. Nothing could be farther than truth. Congress, despite ruling india since 2004, could not nail him down. They are desperate to eliminate him as he is a threat in the election. They could not prove his role. Salman Khan, the bollywood actor, alienated lot of muslims when he said that muslims should move beyond 2002 now as Modi has not been proven guilty. Bad news for India’s future brain drain: according to a new survey by the Economist and mobile phone messaging platform Nimbuzz, 57% of Indians between the ages of 18 and 22 would emigrate to America if they had the chance. Interestingly for India, which is expected to have the world’s youngest workforce by 2020, the reasons aren’t entirely related to the country’s struggling economy—violence and corruption are also big worries. Despite the global financial crisis in 2008, economic growth in India had prompted observers to hail the advent of a reverse brain drain of top students, scientists, and entrepreneurs. But that doesn’t look so good now. India’s economy is in its sharpest downturn in a decade, growing just 4.5% last year. As of May 2012, the government estimates that about 21 million non-resident Indians live outside their home country, or about 1.7% of the India’s population of 1.27 billion. That’s a slight drop from the previous estimates of between 25 million to 30 million Indians living abroad, but still signals a drain of talent and money. The wealth of Indian expatriates has been valued at as much as $1 trillion, according to Datamonitor. than pakistani economy drop for year 2013-14, is aprox. 11 %. Has the Indian economy shrunk over the last one year? A PTI press release states that India's economy is expected to grow to $1.7 trillion by the end of the financial year 2013-2014. But how much was the Indian economy's size previous year? In dollar terms was it less or higher than $1.7 trillion? Interestingly as per an IMF report, name World Economy Outlook published in April 2013, the Indian GDP for the financial year 2012 was $1.8 trillion and was expected to be $1.9 trillion for the financial year ended 2013-2014. Therefore from that perspective the Indian economy has not risen to $ 1.7 trillion but has actually shrunk in dollar terms from $1.8 trillion to $1.7 trillion at a time when it should have been ideally been $1.9 trillion. In terms of rupees, surely the value of the Indian economy has grown up to Rs 105.39 Lakh Crore from Rs 93.88 Lakh Crore in 2012-2013 (Read here). Yet the shrinking in the dollar term is primarily because of major devaluation of the rupee over the last one year. From around the level of below 55, the rupee had a major fall to 68 to a dollar before having a substantial recovery to around 62 now. The considerable depreciation, which was predominantly because of a massive surge in Current Account Deficit (CAD), has to a certain extent arrested but other major concerns, which too have been responsible for the falling trust in rupee, do remain. Therefore apparently even though in rupee terms the Indian economy has gone up, it has not benefitted the economy and on the contrary, a falling value of rupee increases the cost of imports thereby increasing the cost of literally everything, which has a substantial import component, even when that product is manufactured in India. Such increase in costs, including that of the import bills of fuel and gold in addition to a host of other things, eventually result in inflation. While a certain proportion of the CAD was also due to incredibly high level of gold import, one cannot deny that policy paralysis, policy indecisiveness, lack of institutional clarity, issues of corruption, massive delays in clearance of projects and tax feud, each of these did play a role in making India's growth story a sad saga where even increase in the GDP in terms of rupee does not end up in helping the nation at large. Meanwhile efforts to contain inflation have always been with respect to tampering with the interest rate with the presumption that higher interest rate would induce more deposit and reduce expenditure thereby controlling inflation. For the last few years it has been proved that India's primary inflation is because of food prices and not because of organised industry. Therefore unless reforms are brought in the agriculture sector, India's issues of stubborn inflation will not go away. The supply side constraints created by inefficiencies in the supply chain of agricultural products with middlemen making huge profit at the cost of both the producer of agricultural products and end consumers, is hurting the economy a lot. In addition to this, the investment climate has to be improved with a clear cut policy directive. One has to give some credit to the Finance Ministry and RBI for containing the CAD and bringing it down to manageable levels, yet the problems of India will not be solved by that alone. If policy directives are one thing that is needed to be worked upon, the other key issue invariably is that of subsidy. India's gargantuan subsidies and populist policies, be it highly subsidized fuel oils, be it subsidy in fertilisers or be it the food security bill or employment guarantee scheme, each of these revenue expenditures essentially has become a drag on the economy with no sustainable asset development to compliment the money being spent. New York: Investment banks from UBS AG to Morgan Stanley spent half a decade building their operations in India, betting that a growing economy would trigger a boom in mergers and stock sales. They’ve spent the last three years reversing that expansion. The number of investment-banking positions in India has dropped by about 30% since 2010—more than double the pace of global industry cutbacks in the same period—according to the Indian unit of recruiter Randstad Holding NV. Some firms, including Bank of America Corp., have made even steeper cuts. The reductions reflect the falloff in deals and equity offerings involving Indian companies, down about 50% by value from 2010, as the country’s $1.8 trillion economy slows and corporate debt rises. “Some banks have resorted to lowering fees as they chase work, further denting revenues. More job cuts may come as big mergers and stock offerings remain subdued,” people familiar with the matter said. Bank of America’s local unit, the second-ranked takeover adviser in India last year, has cut almost half of an investment-banking team that numbered 40 in 2010, said a person with knowledge of the matter, who asked not to be identified as the details are confidential. UBS has reduced investment-banking headcount to 10 from 16 during the same period, while Morgan Stanley’s local staff has fallen to about 22 from 35, people familiar with the banks’ operations said. Spokesmen for the three banks declined to comment. “Not all foreign firms are retrenching. Moelis and Co., the investment bank founded by Ken Moelis, entered India in 2012 and now has nine bankers there,” said Manisha Girotra, CEO of the New York-based firm’s local unit. Girotra said she plans to add staff in India, calling it a long-term strategic market for Moelis.